On the Saturday before Thanksgiving this year I’ll be packing up some frozen turkeys and all the Thanksgiving fixins and delivering them to families in need who live in one of America’s poorest cities. I’ve desired to do this for several years but previous obligations on that day never allowed it. And at the risk of sounding like a punk, honestly, I’ve often thought of asking the man directing this effort if he thinks the poor that will receive these bagfuls of Thanksgiving provisions have any clue how to defrost and cook a turkey properly. Next week I will be cooking my very first turkey for Thanksgiving. I confess, I’m a little apprehensive, cooking a turkey is no joke, even for an experienced cooker like me with all the accoutrements at my fingertips. I wonder how these individuals or families (who use their stove mainly as an alternative heat source in the winter) will deal with a 17lb frozen turkey. Will these families, in one of the poorest cities in the nation, actually prepare a complete dinner and then sit down together to feast on Thanksgiving Day? Isn’t it more likely they will sell the turkey (and boxes of stuffing, mashed potatoes and canned goods) for money to feed their addictions or to head out shopping on Black Friday? There, I said it. Call me a punk, but isn’t that what a lot of us are thinking? Don’t we view “those people” who choose one holiday a year to serve the poor and pour out food items on them as naïve, foolish or wasteful with their (or our) money? Why join the dozens (hundreds) of others on such a popular service day to give food items to people who will most likely quickly convert the food to cash and then to drugs or drink? You know what… I’m not naïve (much) and in all honestly, I would be truly surprised if more than 2 families in 50 actually use their Thanksgiving food items for a Thanksgiving Day meal. Most will probably just eat the pies. After lunch today we were talking about some loved ones and old friends who are suffering from the affects of Alzheimers and dementia. These dear friends have lost the ability to remember, yet they have not lost the desire to serve. Allowing them to still do some small acts of work or service generally makes a LOT of work for the people around them – but hey, Whoever said love had to be productive? Love, just, is. It is often not convenient. Not logical. Not fiscally responsible. On a day where some of us will choose to give of our finances (for food items) and give of our time (to deliver the food,) the blessing is not for the receiver alone, but effective work is being done on our own hearts through the act of loving through service. What value can you place on that? So I will give of my time and money to feed the poor. I will take my four children along with me (making me even less productive) knowing full well that a large portion of what we give may not be consumed on Thanksgiving Day. A box of mashed potatoes may feed a family on a Monday or a slice of pie may be a teenager’s lunch on a Tuesday. Maybe the food will be sold for illicit purposes. But we will still participate. In this way, on that day, I choose to express the love of my Savior, who loved me when I was unlovable and undeserving, to these precious neighbors who live just six lanes of a highway away from me. For love is not counted by the worthiness of the recipient but by the heart of the giver. In Matthew 25, Jesus spoke these words to the ones who expressed love, he made no mention of the responses of the recipients. So, should we be wise with our finances? Yes. Should we be careful to partner with legitimate groups when serving? Absolutely. Should the possible negative responses of those we serve be an excuse to stop expressing God’s love? No. You may be caught up in the “what ifs” concerning the recipients of a bag of food a few days before Thanksgiving; I, too, am concerned about these things and about the hearts of the recipients. Still, If there are 50 who are hungry, I will feed them. If there are 20? I will serve. If there are only 2? I will give them a meal. Even if there is not a single individual from the many who will receive food on Saturday who cooks up a Thanksgiving Dinner the following Thursday, I still choose to love with my eyes wide open. You nailed it. It is not your responsibility to make sure the food is used for the proper purpose. Your responsibility is to do what God has told you to do. Period. HE will take care of the rest. Lovely, lovely post. 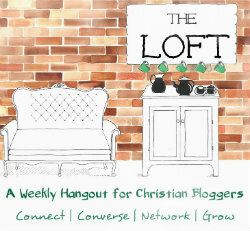 Thanks for joining us at #TheLoft. Wow! That was awesome. I felt the same way with Saturday breakfast for the homeless. First, it is a ministry for the volunteers as much as for the homeless. Second, if one heart is turned to Jesus, then it was worth serving the hundreds of others. Thank you. Thanks for stopping by, Bill. Totally AGREED! – And I love the Sat. breakfasts and the Sat. night serving soup to the homeless is my fav of all. Thank you for sharing this at The Loft 🙂 I think you have spoken so much truth and it has challenged me to not worry about the ‘what ifs’, but continue to show God’s love to the poor and needy, because Jesus told us to. You are right that sometimes it’s not about what the blessing of the receiver alone, but effective work is being done on our own hearts. May we continue to be challenged and convicted until this is a reality! Thank you! Very well said. And a blessed Thanksgiving to you and your family! Thank you! And the same to you. Love this! For me, one of the hardest things to learn is unconditional love. I like to be in control of situations, so I often like my good deeds to go according to planned. Matthew 25 is one of my all-time favorite passages. There are so many questions surrounding how we choose to invest our time or our finances. None of us can understand the heart of another, especially if He has called us to different paths. Praying for you tomorrow as you deliver turkeys, Thanksgiving items, and the heart of Jesus. Happy Thanksgiving!